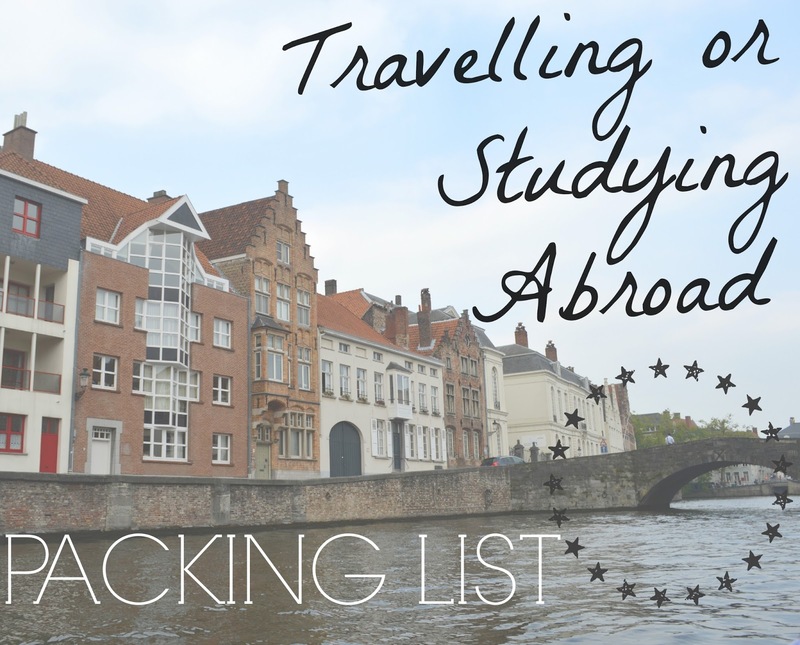 A few weeks back, I read a great little article on The Glitter Guide, one of my favourite sites, outlining some essentials to bring when studying abroad. As I reflect on my own 6-week European adventure, I have created a (slightly longer) list of the necessary, and not so necessary, items to tote along on an extended trip overseas. Check out my other Travel posts here to see which cities I visited. I have a rain jacket from Uniqlo which is just amazing, especially since it was around $40 (it's sadly not available online at the moment). This jacket is so repellant that the water droplets don't even linger like they would on something like plastic. You can literally shake the water off, and the jacket rolls up into a little weightless bundle. Such a steal. I always pack one cheap pair for contacts-day and my good prescription pair for glasses day. I like to make sure I have two, to ensure that I'm never without them. It's so important to protect your scalp and face on super sunny summer days. I'm not a baseball cap kind of girl, but that would be the best option here. A large, or loose fitting hat will surely fly away in the wind and never be seen again. You can refer to one of my earlier posts, linked here, to see my top SPF's. For travelling, either try to find travel size options at the drugstore, or simply fill up some little dollar store bottles with your favourites. Don't bring an umbrella that's really good or too heavy - a crappy one will work just fine and can be replaced for $5 at a market. Invest in a good rain jacket instead! Sure, computers and digital messages might seem easier, but there's nothing quite like a handwritten diary for late night musings, or a quick rundown of your week as you sit in a park. It's an easy and cheap souvenir for looking back on a significant trip, especially if you include ticket stubs or small receipts in between the pages. If you're going to be out and about and don't feel like spending $$$ on disposable water bottles, opt for something like this collapsable bottle from Platypus. It's both functional, and eco friendly. These things can break or be clipped in baggage check, so for security reasons, make sure to have a spare and a few keys to avoid any issues. My poor little alarm clock ended up dying mid-way through and I couldn't bring myself to shop for a new battery. If possible, bring a spare for any clock/watch or small electronic item like a cordless mouse. There's nothing worse than loosing money, ID, Passport, luggage keys, phone, receipts, tickets, small address papers, etc. So I slipped all of those small items into a convenient money pouch. I didn't use it daily, but when I was loaded up with a backpack, carryon and luggage, there was no way I was going to reach into one of those things for a crucial document. Those bags remained locked at all times and I kept the necessary things all corralled against my body in a secure and discreet pouch. I felt silly for initially wanting to bring a few scarves on a summer trip, so I ended up just bringing one. And lo and behold, I used it nearly every day! The weather was unusually cold so I ended up purchasing an extra to switch it up. This just goes to show that you'll almost always use a lightweight scarf no matter what time of year it is. Regardless of where you're going, I'm sure you'll end up needing a lot of change. Transit ticket machines, for example, only accept credit or coins. To avoid fiddling around in pockets and at the bottom of your bag, a cute coin purse can really come in handy. I say chic, because you'll probably end up wearing these with more outfits than you expect. I have a great pair of Stella McCartney for Adidas runners which kept my feet pain-free on the days I wore them. So worth it. You NEVER know who touched what and where their hands have been. It's better to be safe than sorry where germs are concerned especially when travelling abroad. Keep things clean, be cautious of drinking water and always wash your hands whenever possible. Taking out a phone isn't the best idea when you have luggage or are in a station crawling with undercover thieves. It's crucial to be early for trains or planes, since they won't wait for anyone or anything. Avoid confusion and change the time on a digital or analog watch right away when you land in a new country. These are always necessary. No description required. Just get them. When it rains, running shoes get soggy and Birkenstocks get ruined and slimy. Flip flops are pretty useless for walking and can be dangerous when wet, so some type of waterproof sandal or rain boot is a great idea when travelling. Don't forget the flops for beach days or if you will need to use a communal washroom. SO key. Although a cross-body bag is a great call for touring around, backpacks can never be replaced. Whether you're in school, visiting museums or hiking, your shoulders will thank you for wearing that backpack. North American plugs won't work everywhere! Converters and adapters can get quite expensive, so make sure to look out for sales and get at least two before leaving on a trip abroad. I also had to get an ethernet cable and adapter for my laptop to access the building internet when I was studying. It's always nice to break up the day with some good tunes, especially when internet can be slow and TV probably won't exist. Some compact speakers are a great addition to small parties or picnics. Simple toiletry items like soap, shampoo, lotion, toothpaste, cotton, etc. can easily be found in any city. It's also fun to try stuff like gum or candy from the local brands. Refrain from bringing heavy books since there are secondhand bookstores almost everywhere. I made the mistake of bringing my favourite grammar book for class... just no. Expensive jewellery or bags are a big no since they'll attract unnecessary attention and can get ruined in the rain. Heavy high heels just aren't worth toting around. I got a lot of use out of my 2.5 inch espadrille wedges, which worked well for both small day excursions and nighttime outings. I am so grateful for having the opportunity to travel and study abroad, and would recommend the experience to all students. Packing for a long trip is daunting, and I hope this list comes in handy for any future adventures you may decide to take.